In this final part on Cloud Computing, we’re looking at Software as a Service. SaaS applications are designed for end-users, delivered over the internet. 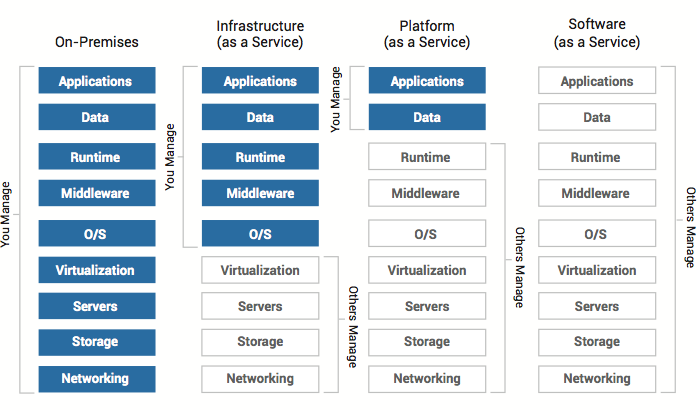 The software itself may be deployed on a virtual server, IaaS or PaaS, but this is irrelevant as far as the user is concerned. Instead of buying and installing an application on thier local machine, they access it via a web browser (often paying a regular subscription). 1. High speed internet is becoming more prevalent, meaning that loading and using applications in a web browser is possible at a usable speed. 2. It’s simpler for the users since they don’t need to install software on a particular machine, and so they can access it from anywhere with an internet connection. 4. Since the software installation on the web itself is under control of the developer, updates can be delivered immediately to all users. 5. It allows a different kind of pricing, which in my opinion is probably fairer. In the past it was quite common for home users to get pirated copies of some larger, expensive applications, e. g. Microsoft Office, becuase it was easy to do and the official versions were so expensive. It seems to me that SaaS is not really possible to pirate so easily as cracking a license code, because that means hacking a web server and creating yourself a new user. Because SaaS products are usually priced monthly, its affordable to try it out (often for free), without the risk of spending hundreds of pounds if you find you don’t use it. It’s also probably good for software companies to have a regular stream of income. So what about some examples? The one that springs to mind for me is Google Docs. It was one of the first full featured office applications to be available on the web, and now Microsoft Office is following suit with Office 365 subscription service. Web based email is also a type of SaaS. There are so many it’s hard to give a flavour of the many different kinds, so instead I’ll just give an run down of a couple of my favorites that I find myself using regularly. To conclude this series on cloud computing, here’s a couple of good YouTube videos that explain the differences between IaaS, PaaS and SaaS.